We saw a ton today, so I have a lot of photos for this post. It was shockingly not damp when we got going this morning at 6am. We thought for sure there would be a ton of condensation where we camped, but fortunately not. It also wasn’t as cold as we expected. Just really random out here sometimes. Today may be my favorite day on the SHR. We hit so many things and went through the full spectrum of terrain. 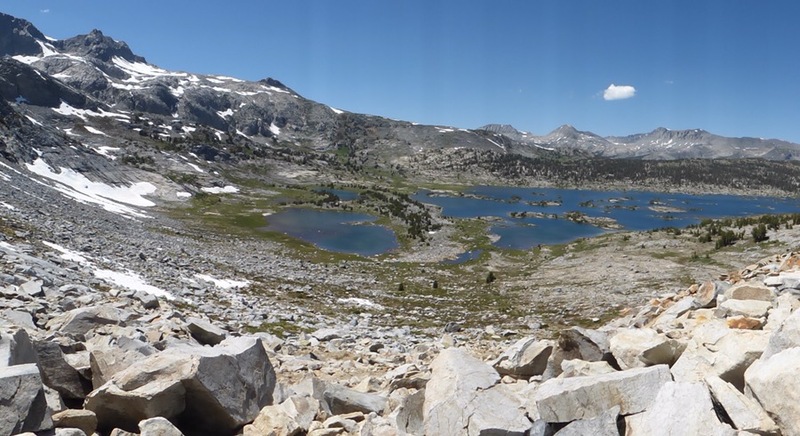 We had a bit of cross country to a light use trail that took us by Minaret Lake. Pretty tough to beat the scenery around Minaret. It had all the Minaret Mtns behind it and when we hiked by, the morning lighting and calmness of the water made for a stunning reflection. 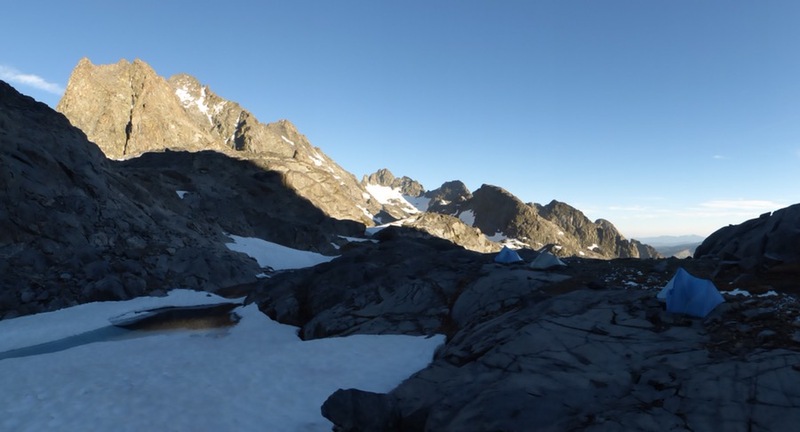 There were climbers sporadically camped along the lake to climb one of the many Minaret Mtns. The next lake was Cecile Lake. We climbed up a short class 3 slot between Cecile and Minaret. It was a fun one. A bit of class 3 climbing. Next up was Iceberg Lake. The tricky part on this one is that snow lingers through the summer on steep traverses and we were hitting it early season and early in the AM before the sun softened it up. 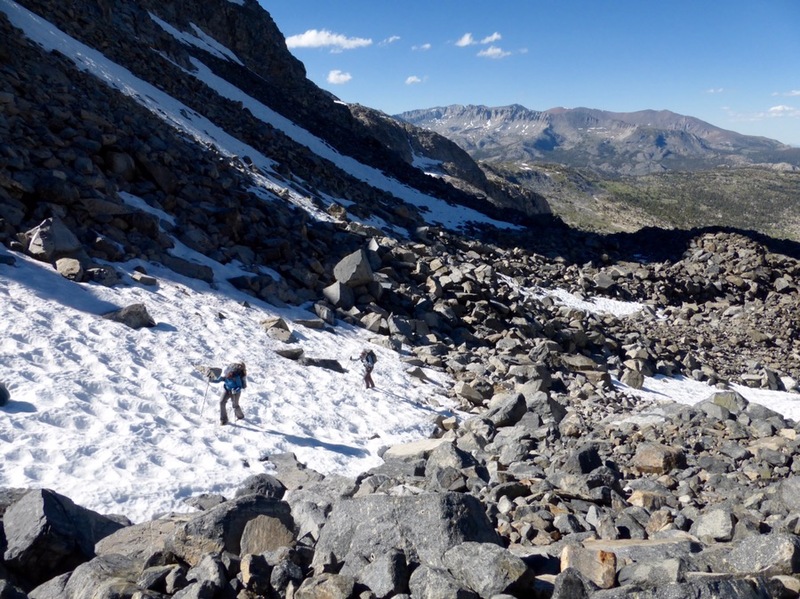 One section of the traverse was much steeper than the rest, but the other snow fields felt safe as we crossed them. 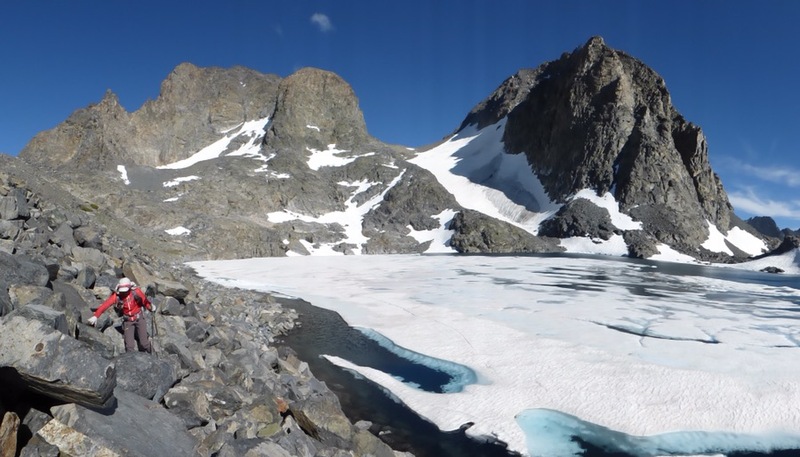 The snowy traverse along Iceberg Lake. 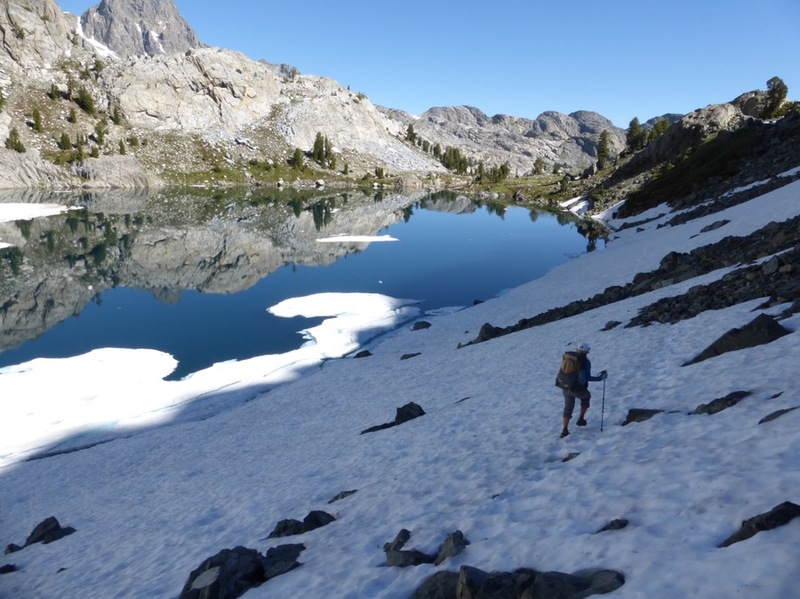 Why Not on the snowy traverse of Iceberg Lake. We saw more hikers as we were on more commonly used trail for a bit before heading cross country again to a great lunch spot at the base of Mt Ritter and Banner Peak. Our lunch spot goal beneath Banner and Ritter. Rockin summited Banner and Ritter with her family when they were completely covered in snow the week before we started the SHR. It was great to have lunch there. Also, we will continue to see Banner and Ritter for quite a bit as our route will go around them. 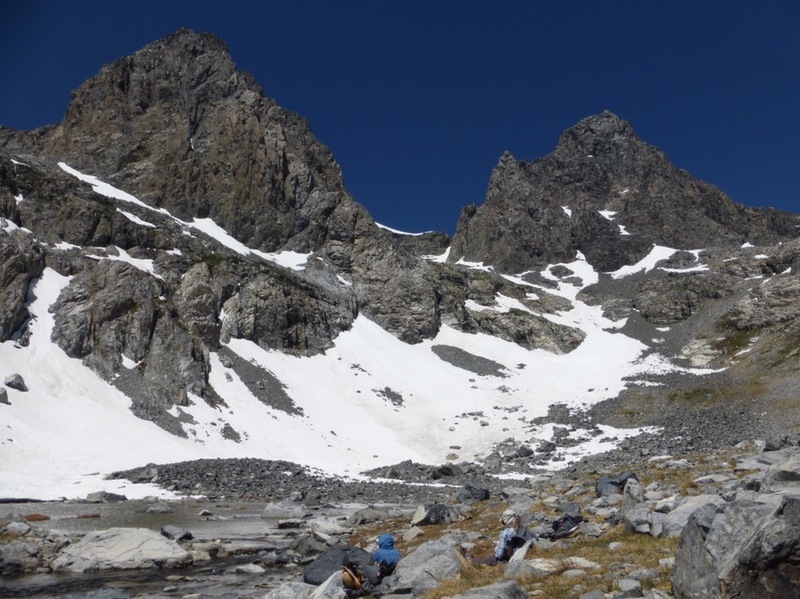 Lunch beneath Banner Peak (right) and Mt Ritter (left). 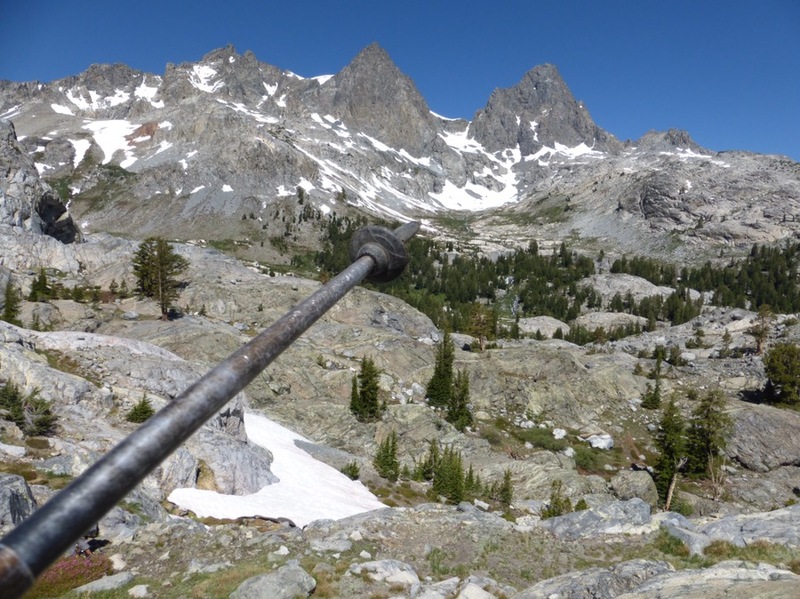 After lunch, we had a nice gradual cross country climb up to Whitebark Pass. The passes today were probably the tamest we’ve had all hike. We saw two other pairs of hikers that also went over the pass the opposite direction of us, which was unique to see backpackers out for a couple nights doing an off trail route. 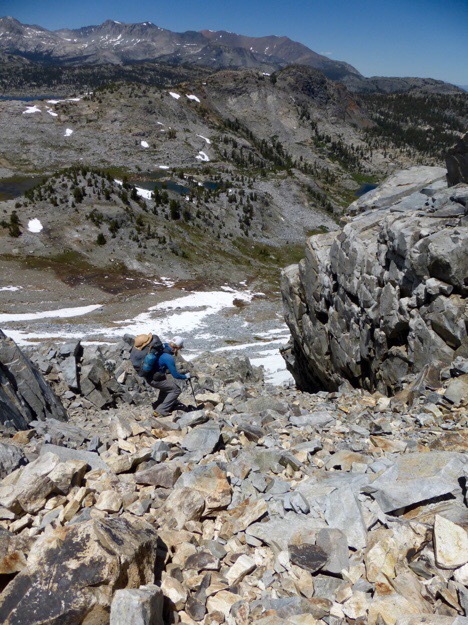 The north side of Whitebark Pass had a lot of talus to go down. It is interesting that, although I don’t like the talus, I am getting more relaxed on it and moving more efficiently. Actually, overall on the terrain out here, I’d say the same thing. It’s not my favorite thing to do, but it’s been a nice change of pace and I’m becoming more fluid and natural on the more unstable and sketchy terrain. 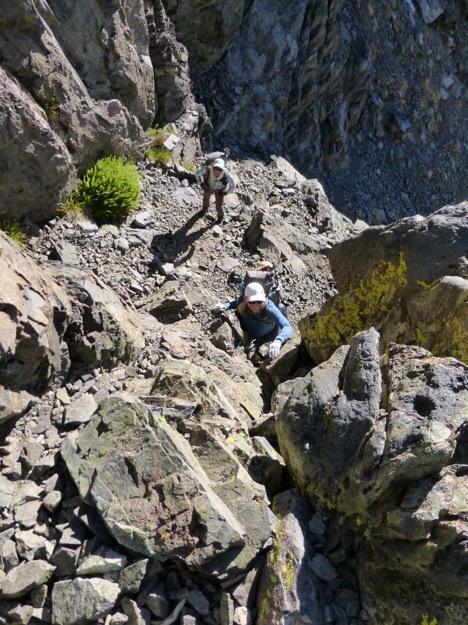 Why Not descending the talus. After having been to Thousand Island Lake a couple times before, it was really cool to see it from another perspective and be on the more remote side of the lake. Still, we saw some people walking along it from a distance. Our directions were to walk through the isthmus between the lake and body of water at the end. I only mention this because when else will I use the word isthmus!? 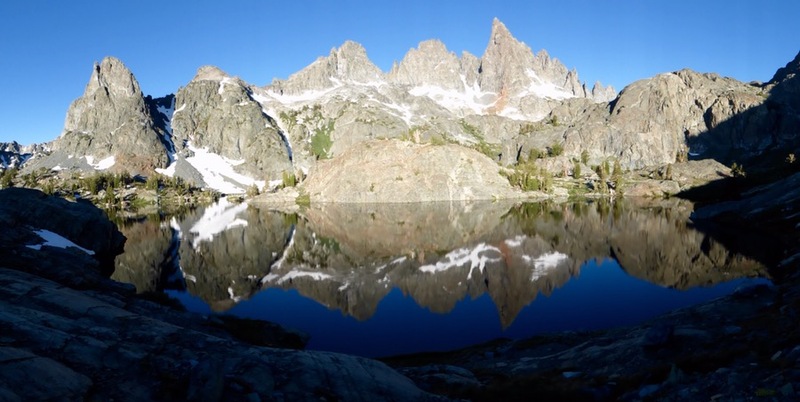 Thousand Island Lake. We walked the isthmus in the center. 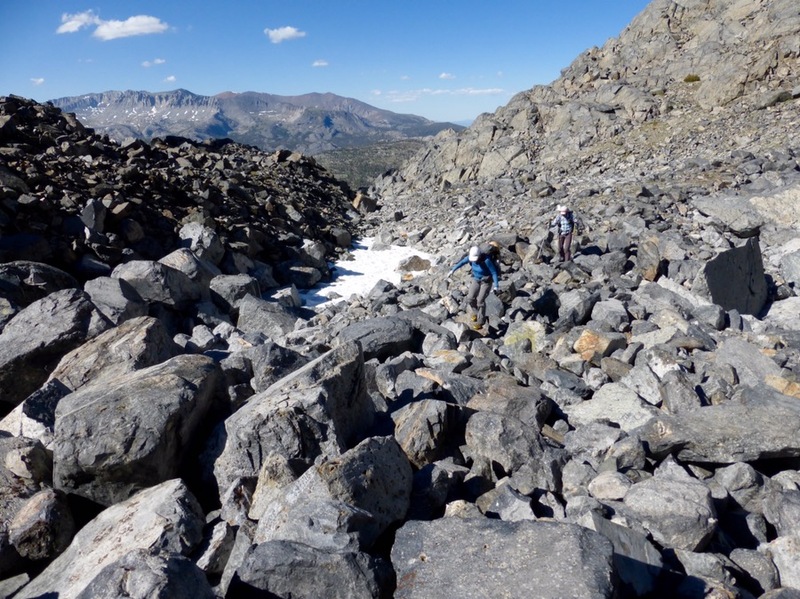 For our final pass of the day, we had a very long and gradual ascent up and over Glacier Lake Pass. 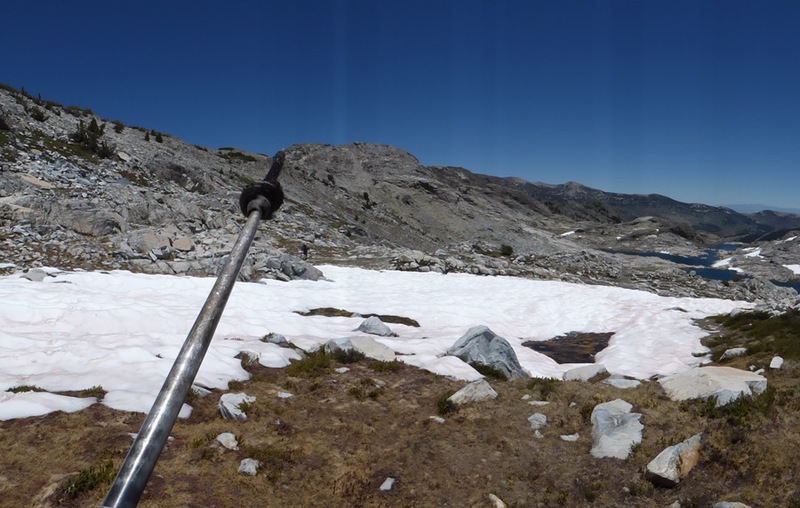 We basically followed an inlet to Thousand Island Lake up to the pass. 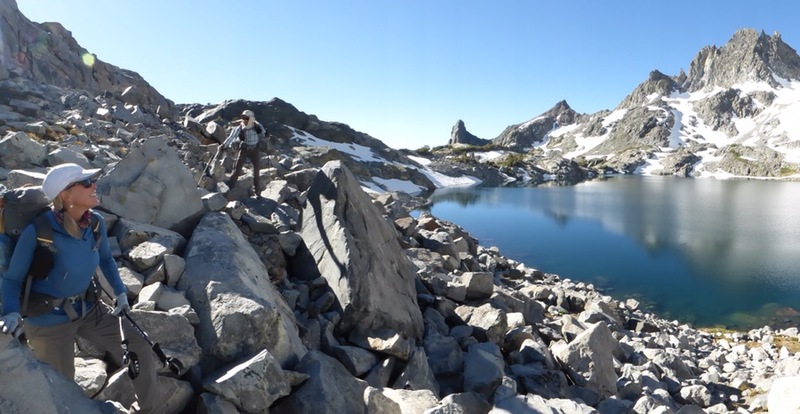 It’s pretty cool to know I’ve hiked up a main source of Thousand Island Lake. Getting over Glacier Lake Pass at the end of the day was tiring after all we had already done. There was a good mix of snow sections and medium sized boulders for quite awhile. I felt like this pass was one of the longest we’d done and it just kept going. 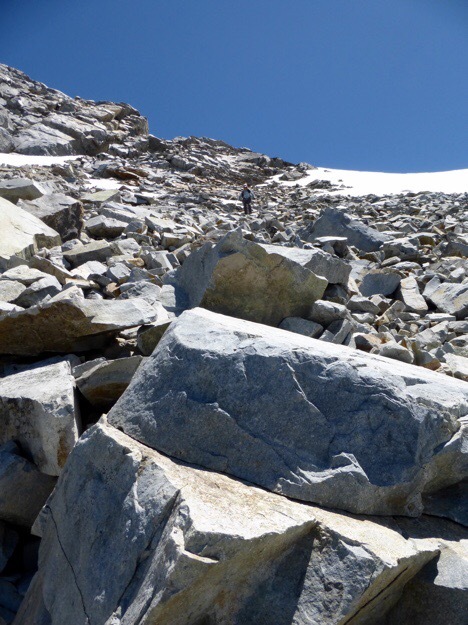 Hiking snow up Glacier Lake Pass. 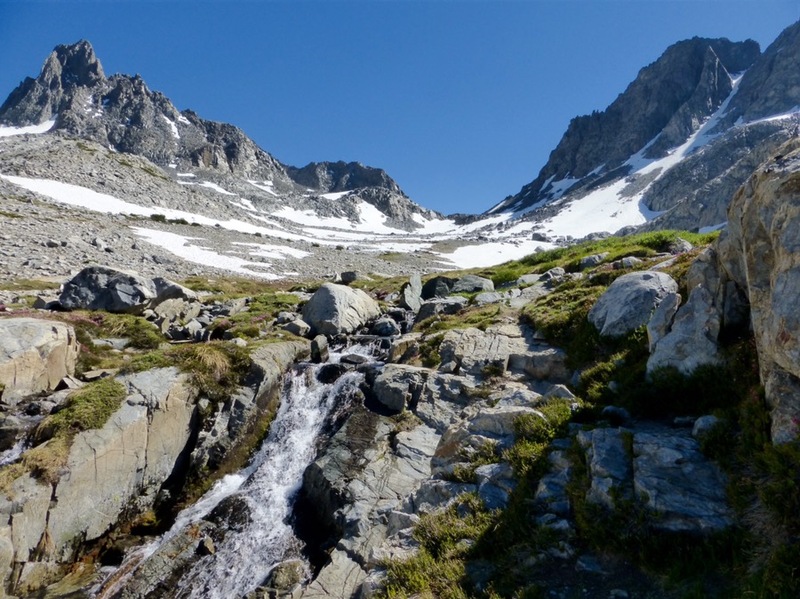 The goal was to camp at the end of Catherine Lake on the other side of Glacier Lake Pass. As soon as we saw it, we knew our chances were low because there was still a ton of snow at the end where we’d be able to camp. The view of the lake was awesome though! Even cooler was that we were on the other side of Ritter and Banner (where we had lunch) and they towered over the lake. Why Not on the talus. 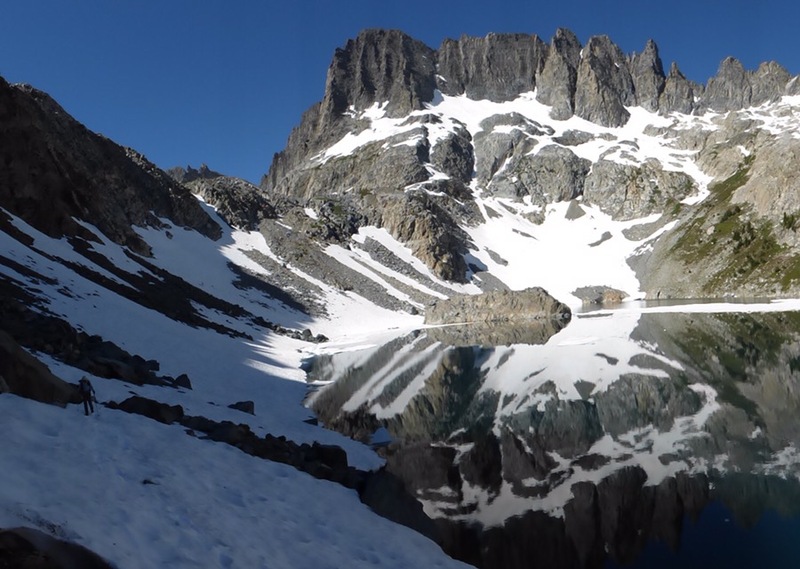 Lake Catherine with Ritter Mtn and Banner Peak behind it. 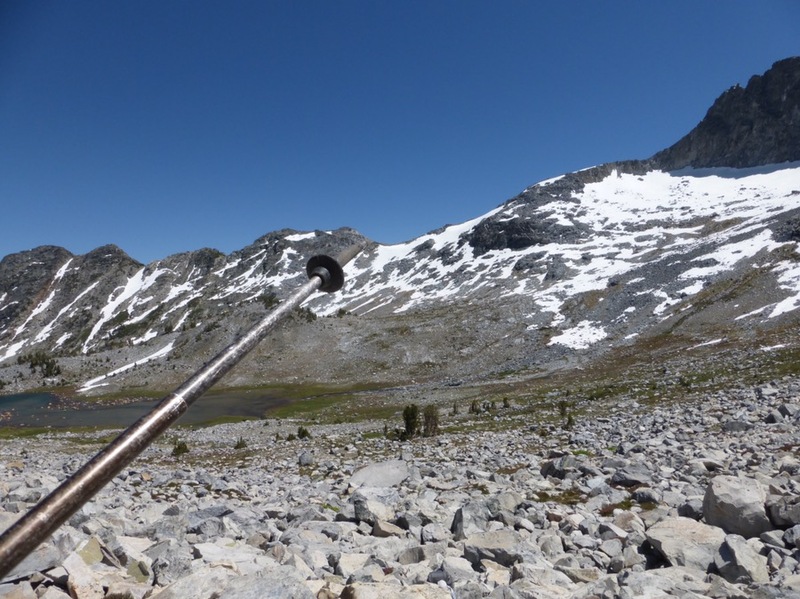 We had a decent amount of talus left to get to the end of the lake and we were really ready to be done with the day and set up camp, but there was snow covering our campsite. We spent the next 30mins searching around and hiking a bit further. Looking ahead, we could see that our options were quite limited unless we hiked at least an hour more. Strong wind had kicked in and it was quite cold, so we needed to pick a spot. We got creative and found a great spot along the outlet of Lake Catherine. Our campsite with Ritter on the left. The catch with our campsite is that it had to be on a rock slab and our ZPacks tents are not free standing. We use our tent poles for the height and anchor the ends with the stakes. This happened once earlier this trip and I’ve had a lot of situations like this, so I taught Why Not and Rockin’ a cool way to pitch if you have rocks and can’t get stakes in the ground. Here are photos with an explanation below. How to use rocks instead of stakes. First, choose a relatively smooth rock that is around fist size. Take the guy line of your tent and pull the line through the loop already at the end for your stake. This will form a sliding noose to put around your rock. Obviously, this rock won’t be strong enough to hold your tent. 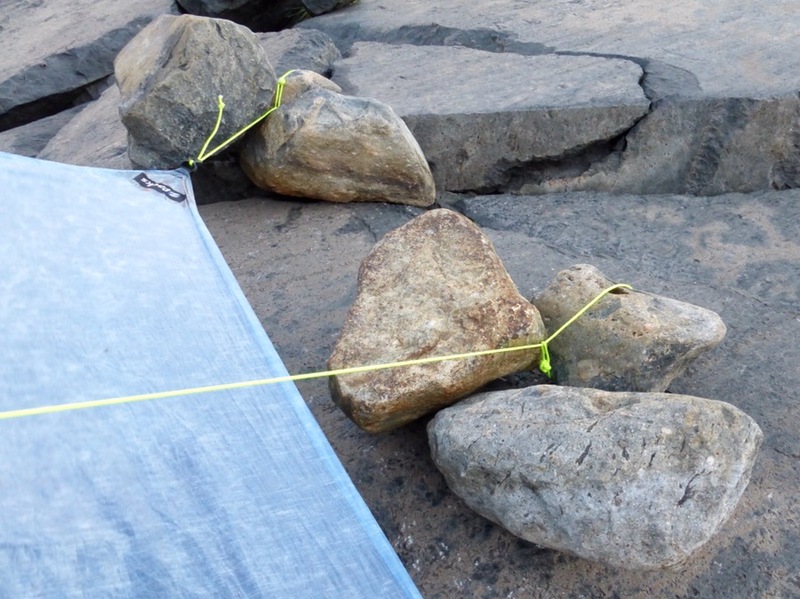 You then use 2-3 larger rocks to hold that rock in place without impeding the guy line. That way the guy line doesn’t rub on a rough edge overnight and possibly weaken it. 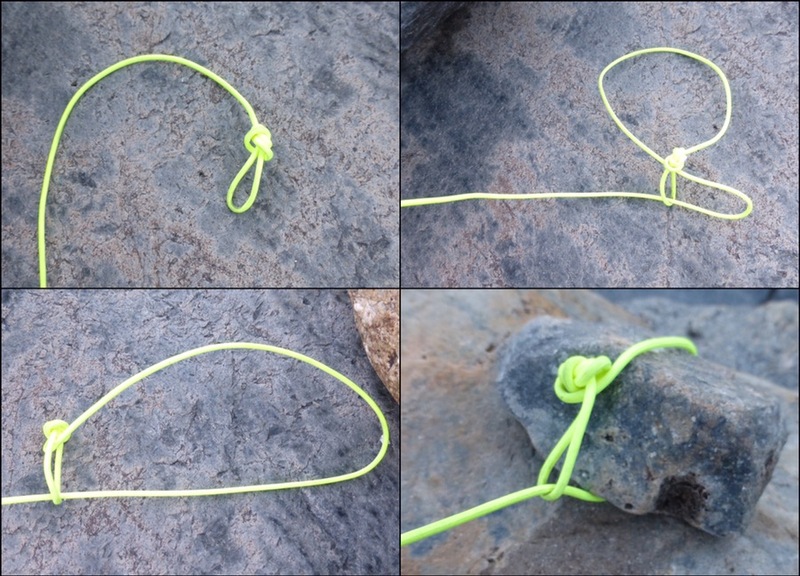 Example of how to use other rocks to anchor the smaller rock. Yes, this method is more time consuming, but it works in a pinch like this where we really would have had to do at least another hour of strenuous hiking to get to a site where we could stake out the tents. Does this method work in high winds? It totally does! It is super windy tonight and our tents are now securely standing. I think we all are pretty proud of our work with the added challenge of the cold and wind. We love our ZPacks Solplex tents. We are in quite cold temps and it’s super windy, but we have no tent flapping and feel nice and warm and sheltered in our homes. What a complete day! Thank you for my word of the day, isthmus. Fun to say and write. I still don’t know if I’m even saying it right, ha! Now I had to look it up. The three of you bring so much experience to the table to help each other, and learn more, gain experience and grow. I don’t know that I’ll ever be truly comfortable on it, but I’m glad the complete fear of every step is gone. 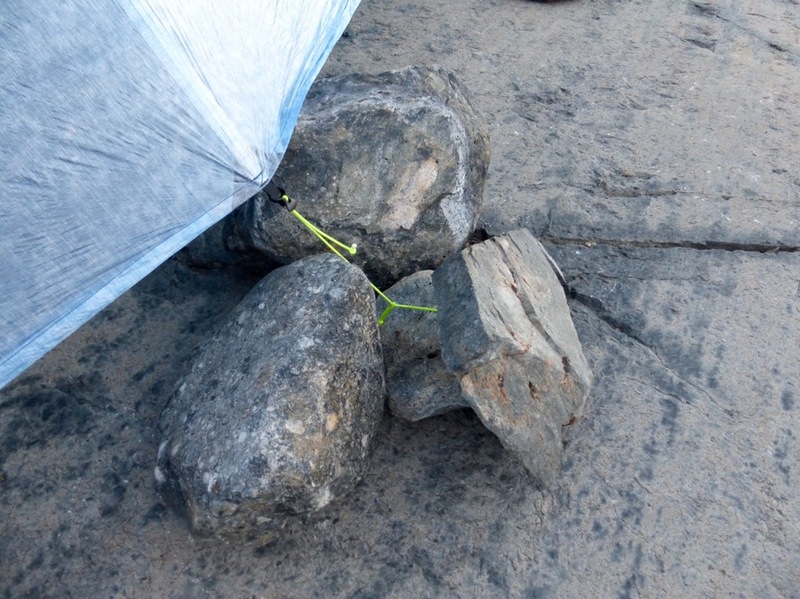 Thanks for the lesson on staking out the tent on rocks. I did not know that one. Don’t ever stop your wonderful blog. “We climbed up a short class 3 slot between Cecile and Minaret. It was a fun one.” I never thought I’d hear you say that. Glad you are doing so much better. I know this type of terrain would be very tough for me too. Thanks for the rock tutorial. Very helpful and smart.